Visited this restaurant twice absolutely fantastic service surroundings price and food all brilliant. When it comes to steak, Del Toro serves only the finest cuts. They are aged for tenderness. Then, a very special blend of seasonings are added to lend a unique flavor while still allowing the natural properties of the high quality, well aged beef to be enjoyed to its fullest. This ensures that a tender, succulent, flavourful steak is guaranteed every time. Have you got Google Earth on your computer? If so, then download the Google Earth Map of Del Toro. Is this the wrong position for Del Toro? If you think so, then modify its position. Have visited this restuarant on many occasions and have always found their food to be first class, especially their steaks. They are to die for! !The staff are so helpful and courteous, altogether a real pleasure to be there and I certainly hope my husband books me in for mothers day, Cant wait! �96 for two, a bit expensive I would suggest for a mediocre steak and duck and desserts had to be shared whether you liked the same option as your partner, or not! The first steak was returned as it was still blue, and bizarrely for a 'restaurant of the year' they asked ME to check if it was cooked to my liking! Service, food, setting less impressive than many of the local pub grills, way,way over priced. Unfortunately, for this business's, their greed has resulted in a restaurant full of duped people, like me, who will spread the word. was here sat 7/12 with the wife chicen special amazing and aero cheesecake was the buisness, 3rd time here never found a fault!! We first visited Del Toro yesterday evening. The food was good but the service very poor. Despite arriving before 6 pm, at which time there were not too many diners, and despite there being plenty of staff on the floor, we had to ask twice for a jug of water; then, although a dessert menu was left with us, no-one came back to take an order. We left without a dessert and did not leave a tip as we usually would. Food good but service needs to improve. Del Toros gourmet night on Tuesday 14/6/11 was absolutely amazing. Seven courses with matching wine. Four of us went and we all really enjoyed it. My wife and I have been regulars at Del Toro for a year. We don't understand the reviews that state the service is poor and food average. Can't help wondering what establishments the folk are eating in. Hard to imagine they are in Lisburn. We give most of the restuarants in the town a 'turn', Del Torro is, in our view, the best for food, service, value for money and ambience. You really do need to judge for yourself as the poor reviews don't reflect in any way our experience in the past year. We booked for 9pm on a Friday eve, arrived on time and it took 45 mins for us to get a bread 'nibble'. After a further 40mins and no sign of any further food we left. No real appology, paid for what we had in full (wine, bread and one salad), no incentive to return. Del Toro perhaps a victim of its own success!! Was here for Sunday lunch and I must say the food was great, really tasty! Had the tomato soup to start and then the half roast stuffed chicken, very generous portions - great value for �15. The staff were very welcoming and nothing was a problem for them. 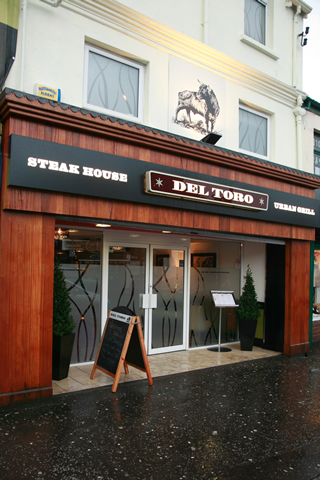 i had a look at their lunch menu while there and it looked fantastic - it had meals like chicken pie dinner, panini's and chips and goujon wrap and chips for around �6 - next time I'm out shopping in Lisburn i will definitely remember Del Toro! We held our works x-mas party at the Del Toro on the 11th Dec, and have been customers of Bronagh and anthony for some time, knowing the high standard of service and food we recieve time after time, i can only think that people who put poisoned remarks on this review, should first think of the frame of mind they leave home in before any visit to any customer service based business. Myself and my husband recently dined at this venue on sat 18th dec after hearing such great reports and reviews we decided to sample it for ourselves.I was not impressed ! When we arrived we could see that it was quite busy but we had booked for 7.30 i did expect to be seated within 5 minutes of arrival however that was not the case after 15 minutes we were shown to our table and had to wait a further 20 minutes for our food and drink order to be taken then it took almost 15 minutes for the drinks to arrive at the table. Shortly after we ordered our food a large party arrived presumably an xmas work dinner and guess what ,they were seated within 5 minutes they had their drinks order taken immediately then thier food was quickly brought to thier table before our starters had arrived in fact they had finished thier starters and ours still hadnt arrived .eventully the starters did arrive at our table and the waitress basiclly threw down the plates and stormed off . ''starters were average'' nothing worth shouting about. So the table was cleared and after another wait of 20 mins and another large table arriving our main courses arrived by this time i wanted to get up and leave but my husband decided we should stay, so again plates threw down in front of us by the same waitress and again away she stormed . Again'' nothing worth shouting about '' when we had finished we were asked if we would like a dessert menu ??? I did state when we arrived and the order was taken we would be having the three courses of the xmas menu . Then it got worse when the deserts came to the table it looked as if they were lying for a few days and they didnt taste much better they were horrendous after confronting the waitress who i later learned was the manager on duty she did after some coaxing agree to refund the cost of one of the deserts . All in all the night as a whole was a terrible experience, costomer service was a joke and the food was shocking not to mention the price .Im sorry but this place needs to improve if it dosnt i cant see it making an impact on the restraunt trade in lisburn ..
Was in for an express lunch yesterday and I hace to say my friends and I found the food wonderful and so reasonable too. �5.95 for a gourmet lunch. The decor was so warm and homely, and the staff were very friendly and made us feel very welcome. Honestly could not find one complaint!! Next girlie day out we will be back!! I had never eaten in Del Torro until last night when 10 of my friends went there for another friends birthday. The welcome was very friendly and professional, we were shown to our table very quickly and the staff were very polite. The service was outstanding! They had a full restaraunt and only 3 staff but it did not show. Service was quick and professional, yet friendly and welcomming. The food was outsatnding, I had the cod, which was lovely but other frinds had the steak, which I have to say that I am not overly keen on but that was outstanding to the point that I was jealous! I've eaten in Del Torro on four occasions. The food has been first class everytime. The early bird price works out cheaper than Premier Inn!! I've also taken friends who have more than impressed with (a) decor (b) food (c) service (d) value for money. Excellent....lovely to have a truly good eating establishment in Lisburn. Six of us recently travelled a distance to have dinner at Del Toro which was well worth the journey! Our greeting was very welcoming and the service was excellent. I ordered my steak rare and often when I do I never get it cooked to my liking but on this occasion it was perfect. When I asked the waiter his advice on the sauces he was very helpful and encouraged me to try a sauce I wouldn't normally order - it was delicious! My husband had fish and is still talking about how delicious it was. The wine list was excellent and we all enjoyed a few glasses. We had a great nite and will definately be back later in the year. Congratulations Del Toro! I booked a table for four. On arrival we were given a very poor greeting, waitress behind the reception desk was too busy checking her mobile phone! However we were shown quite quickly to our table, drinks ordered and food order taken. The decor inside is really beautiful and it had a nice atmosphere. Our food was exceptional however the waitress service was very disappointing. The girl serving our table didn't seem to have any skill or experience. She was very unstable holding the drinks tray and glasses and plates were set down heavily in front of you. There were only three floor staff on duty, one behind the bar and two on the floor. I felt they were very short staffed and just before 9pm, one guy finished is shift and went home, exiting the restaurant at a very busy time, hugging another fellow waitress and leaving in full view of all the customers still waiting to be served! Very unprofessional. We all had a main course, sweets, one beer and soft drinks and the total bill was �110. Excellent food and Lisburn certainly needs a good restaurant, however for this price I think I would choose a eating house with a better location than Antrim Street. Just to give you an indication on pricing, we ate recently at Pier 36 in Donagadee, we all had starters , main courses and sweets and the bill totalled �75.00 and the food was amazing. Good food but very expensive. Del Toro a restaurant that you couldn't afford to go to regularly! My husband and I recently visited Del Toro on Saturday 15th May, and we were extremely impressed with EVERYTHING..... Service staff were very welcoming, and answered all questions we had regarding the food and wine...our waiteress was able to inform us on the new menu that is going to be launched in the coming weeks!! sounds fab!!! Very disappointed in our second visit to Del Toro, to cut along story short our main course was served to the table behind us, and on discovery brought into the kitchen and reserved to us. The waiter tried to deny this saying "no honestly the chef says its ok", I had heard the same waiter ask the man behind me had he touched the food, when he said no he said "that will be okay then". The manageress who was too helpful when we arrived was nowhere to be seen at this stage. I am sorry I accepted the steak as it wasn't cooked how I ordered and was warm not hot. I'm just sorry I didn't make a bigger fuss at the time but last night we just wanted our dinner and to leave. first time in restaurant last week-have to say was very surprised, the decor is very warm and welcoming and cosy. The food was first class as were all the staff - very attentive and well mannered. Good to see a 1st class food venue in the vicinity... well done to Del Toro!!! Del toros is one of the cleanest eating houses i have been in spotless and the decor is so relaxing the candles and fresh flowers make the place. My husband and I went on Friday night. I have to say the steak was lovely and tender. However the accompanying pepper sauce was horrible! It was more like a kind of mayo with peppercorns in and I was very dissapointed. I would also agree with comments that it is overpriced I ended up paying well over ?20 for my steak as you have to pay extra for sauce and sides and I think ?3 for a soft drink is very pricey! I would consider going back but only for the earlybird menu or perhaps lunch. been to del toro twice now and it has to be one of the best if not thee best restaurant in lisburn with excellent customer service!! well done. I was there on tuesday 27,04,10 my self and my husband first impressions were great we were quickly greeted and seated we then proceeded to order our drinks , which were promptly delivered to our table ,the waiter then took our food order which was the usual starters and main courses the starters were fantastic.Its a pity i couldnt say the same about the mains which were steaks my steak was covered in oil ,tough and cold the vegetables were unedible .The waitress then came to clear the table and i confronted her about the poor quality of the food , i was then made to feel as if it was my own poor tastes , she then continued to be verbally abusive towards me making the assumption that i was looking foor a free meal . Basicilly the food was poor and the costomer service was applalling .I had this restraunt reccomened to me by three different friends god only knows what they seen in this place ..I for one will be back . Well what can i say.... OUTSTANDING!! We were made to feel very welcome by the host on our arrival,no hangng about!! The Steak was melt in your mouth, and the seabass was just delightful, the atmosphere was superb, the staff were so friendly and i can honestly say one of the best meals i have had!! So thank you for a splendid visit. I hope everyone reading this gives it a go!! I haven't been to Del Toro and keep meaning to but one thing that's off putting is the fact that there's no menu on the website, I like to know a ball park figure of how much a place will cost to eat in as well as a rough idea of the menu before I go... why no menu? Best steak i have ever eaten, staff were excellent. The decor is very nice and clean.Will definitely go back. 6th time to del toro, you would think after this amount of visits i could find even the smallest of faults.its consistency in turning out great food deserves industry notification. Hi i was here last night and must say everything was excellent trom the minute we walked in the door to the time we lefted. Bronagh and her staff were very pleasent and helpful and we were made to feel very welcome. I had ribs for starters and t bone for mains then apple crumble for dssert. My friend had soup for starters fillet for main and cheese cake for dessert. I checked out the toilets and found them to be spotless i always check tthis before i eat at a nrew place. I read the reveiws before i went and was nearly put off when someone said about London prices, i am so glad i went the person who wrote this must bot get out to much i found it to be well priced. Just want to say well done to Bronagh her staff and the people in the kitchen and i look forward to going back. What Lisburn needed - a great restaurant. Food, staff and service is of the highest standard. Steaks are the best I have had in a long time. Well done Del Toro. Staff very friendly and attentive. Food very good quality and buzzing atmosphere. A little pricey but good for a special treat. Would like to try the early bird menu. i would not recommend this restaurant.service was very slow and food tastless.both scampi and wedges clearly just out of frozen packet.i will not be back. Very good, Lisburn is crying out for places like this. Great food, friendly and attentive staff, and reasonable prices (you get what you pay for) make this my favourite in Lisburn. Long may it continue. Went for 1st time on a Monday night after Xmas as nowhere else serves food on a Monday in Lisburn. Had never heard of this place before, so was going in open minded. OMG - so lovely inside! We hadn't booked so had to wait a few minutes as there were 4 and a baby. I am fussy when it comes to eating out and usually go for veg option. Had Goats Cheese Chiabatta for starters - delicious! Decided on Chargrilled Chicken and noodles for main course - again delicious! I loved everthing about it! The rest of my party had steaks and all loved them. My Father-In-Law is hard to please when it comes to steaks and he really enjoyed his! I would recommend this restaurant to friends and family not only for the delicious food, but also the friendly welcoming staff. to dear and wheaten bread was not nice. Very pleasant food, excellent staff, a little pricey but very enjoyable. A friendly, relaxing and inviting atmosphere. The food was absolutely delicious, plentyful and very reasonably prized. The decor is of the highest standard and the staff are courteous and extremely helpful. I would strongly recommend this restaurant to anyone looking for a great night out. was pleasantly surprised by this new restaurant - menu was excellent, really varied selection even though its a steak house. Lovely warm atmosphere and very attentive staff at hand. My wife and I eat out at least once a week and I have to give credit where its due - 5 out of 5 all round! Good for you guys!! Food is of an excellent standard, staff are knowledgeable and attentive and the atmosphere that has been created is just perfect. What more could you ask for? Just what is needed in Lisburn. We arrived 10 minutes before last orders, but were still made to feel very welcome. The staff were superb and very attentive. Our food was delicious, with our only slight gripe that the sauces were a little cold. We were offered desserts, coffees etc and never rushed once. I thought the food was well priced, superb quality and could be compared to the best anywhere. At last, we are getting a good range of excellent eating houses in Lisburn! Steak was beautiful, but too price to go often. Food was average and the price is a joke. Its Lisburn not the centre of London!!!! Highly recommend this restaurant. Great to see some life in Lisburn after dark. Burgers to die for!!! Have been for lunch and dinner on a few occasions to Del Toro and would really recommend it. It's in a great location with plenty of parking close by. The restaurant itself is lovely with a warm and welcoming atmosphere. The staff were very friendly and the service was excellent. The food was superb and on each occasion I ordered a different dish and was not disappointed. Would have no hesitation to recommend it for a great night out!